Even as I put this piece to bed on a Saturday evening, I wonder what may be going on in the heads and hearts of the young men who will represent Teams India and Pakistan in the finals of the ICC Champions Cricket Trophy 2017 that will be played in England. What is intended to be a sporting tournament, is being bandied as a proxy war between two nations—on the apparently neutral ground of a country called England. The players, as they prepare to take to the field, are being described as “gladiators” in a “clash of titans”? 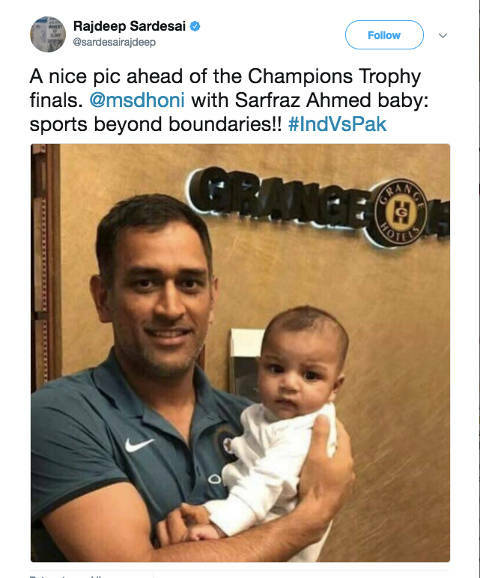 But in the mother of all ironies, it was only a little while ago that well known journalist and television anchor Rajdeep Sardesai posted a picture on his Twitter handle of MS Dhoni holding the Pakistani skipper Sarfraz Ahmed’s baby. 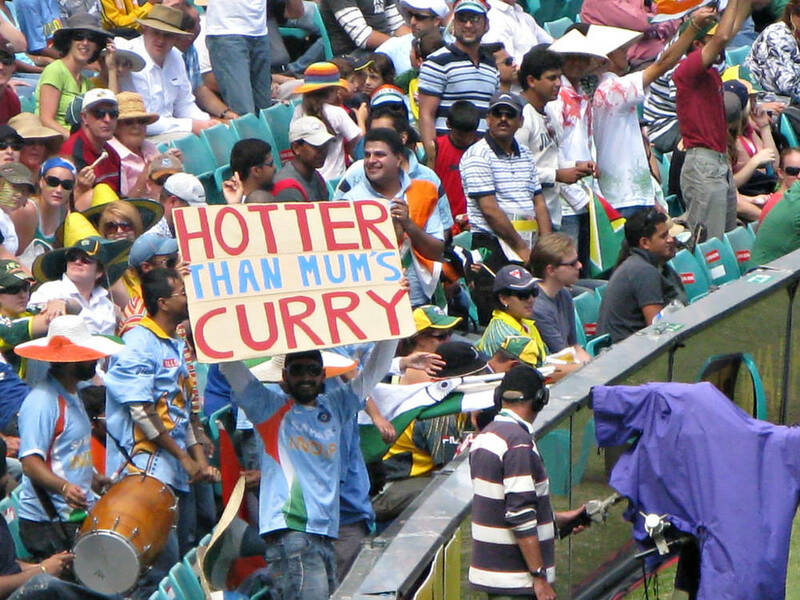 In fact, if history is anything to go by, all the ire of people watching the Indian and Pakistani teams play, ought to be directed against the “whites”. They were the ones who first sowed the seeds of discord among the “brown natives”. Their devious ways started in the 18th century and lasted until 1947 until they finally left. But after having cleaved the Indian subcontinent and much blood was spilt. They now look benign though as they continue to sip beer, munch fish and chips and watch with much amusement as the brown boys and fans in their homelands continue to bay for blood. If any evidence be needed in popular culture of how short memory is, all that needs to be done is revisit Aamir Khan’s Lagaan. Khan got it right. 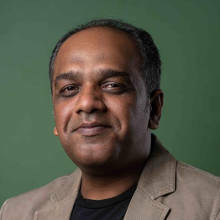 He could see everybody’s primate selves and scripted a movie around a bunch of bumbling “brown natives” slug it out against the “white sahibs” to win a cricket match—and while at it snag one of their women as well. Everyone applauded the movie then. In hindsight though, the climax looks comical—almost farcical. Khan facing the last ball now looks more like a dhobi holding a washing paddle than a batsman at the crease. But as things are intended to be in movies, that is the stance he used to whack the ball out of the boundary, beat the British, win the match, and laugh his way to the bank. It isn’t that Khan has his finger on the pulse of the people. He had tapped into ironies. Because that bat (or washing paddle if you will) that he used in the movie was auctioned for 60 lakh Pakistani rupees at a fund raiser in Lahore—the proceeds of which went into funding a hospital that was then being built by the Pakistani cricketer Imran Khan in memory of his mother Shaukat Khanum. When did violence permeate into something as benign as a game of cricket? Talking of ironies, if one were to listen to the voices and headlines now preceding the “Big Game”, you cannot help but wonder when did violence permeate into something as benign as a game of cricket? In its original avatar, it was played over five days. That’s the kind of time those lazy English blokes had on their hands. But violence in sport is of a benevolent kind where everybody has a good time while the game lasts. Not a cricket match between India and Pakistan though. This is more than just a game. There is no taking away from that the losing team on Sunday has a lot at stake. Players will be lynched by blood thirsty mobs, their families will be mocked, and people from the nation they represent will hang their heads in shame. Then idiots on social media of all kinds will take pot shots at each other even as they wear their national identities on their sleeves. At home or with friends, if I don’t support the “Men in Blue” and shout out loud that I have nothing but contempt for Team Pakistan, between my daughters and friends, I will be branded an anti-national. When did things come to such a pass? What am I missing here? When given some thought, this sporting event is a metaphor for the larger narrative for a society and discourse at conflict with itself. The nature of the world we live in now is such it insists everyone take a stance, have a stated position and a world view. Do I have to? Because I must admit there are many things I do not understand. And as things are, there are two lawyers battling it out in my head. Much like everyone around, they too insist I pass verdict. Their arguments are sound. But the territory they stand on is a morally ambiguous one. The adjudicating judge in my head though is unable to pass verdict. That is why, may I suggest you pause for a moment to listen in to the arguments presented by the imaginary lawyers in my head before tuning in to the match? You can read this on a lazy Sunday on a device you purchased, at a time and place you choose, on a platform of your choice. And if you don’t like how these lines are written or how this page looks to you right now, you can move on to whatever it is that gets your attention. It is a choice you can exercise because you are rich, can afford to buy a device, pay for access to bandwidth, and choose any which platform you think appropriate. But I am reasonably sure, if asked to pay for the time and labour my client invested to think through this piece and write it coherently, and compensate the editors, designers, and programmers, all of whom worked as a team to make this come alive on your screen so something of value be delivered—you will decline to pay. Whatever is the matter with you? What kind of morality do you subscribe to? Is your hunger hungrier than that of my client and that of the team that works with him? Is your money harder earned than theirs? Clearly, you do not appreciate value, are selfish, and do not deserve any mercy. Because you refuse to pay my client for the sweat of his brow, I feel compelled to urge the judge to allow my client to thrust something in your face that he may sustain his livelihood some other way. If that may include intrusive advertising or fake news, so be it. At the end of the day, he has a right to livelihood, much like you do. Therefore, all resources must be distributed equally among all humans by consciously decided mechanisms. There ought to be equal distribution of wealth. Call it Socialism or Marxism if you will. But the resources must be equally deployed. Else, it is inevitable that those who are left out will feel ridiculed, violence will creep in and society will collapse. It is morally incumbent on us to avoid violence in all its forms and ensure equality for all. If left unchecked and only for the rich to enjoy, the most sublime of pleasures in our lives, like a cricket match that can be a sport enjoyed in equal measure by everyone, will turn out into a vicious blood bath by which values like success, allegiance to the tribe, or patriotism in other words, are measured. What kind of a ridiculous argument is that? How can any human take a call on how resources ought to be distributed equally? When they allowed it, what emerged and continues to stand is a capricious, greedy force called capitalism. Look at what it is doing now to these poor creatures around—my client and his children included. Allow me to present some evidence. Why does everybody seem wedded to their cellular phones and the apps that reside on them? When thought about, it is for a simple reason. A few private entities called Google, Facebook, Amazon, Apple and Twitter influence public discourse across the world. Implicit to that statement is that a few dozen technologists and designers who live in Silicon Valley will decide what course my client’s life and that of a few billion others ought to take. They were created by the forces of capitalism. When did my client and a few billion people like him concede their lives to people in Silicon Valley? What do those in Silicon Valley know about my client? How did they wrest the narrative that is my client’s life into their hands? But now that they have, may I submit there is a moral obligation on those who control the narrative from Silicon Valley to do what is in the best interests of my client and everybody who uses their services. But the places these people work in are explicitly built and funded by entities to maximise their profits—not better my client’s life. That is fundamental to capitalism. That is why the systems they have built, including the algorithms that power these sites, know what my client is looking for on Google and serve him just the right ads. They call it targeted advertising. Why does Amazon suggest my client may be interested in buying something (which may indeed be the case) basis what it already knows on the back of his past browsing habits? And the monstrosity that is Facebook, how does it dredge people he has long forgotten about and suggest they be added as friends? When looked at from the perspective of these entities in Silicon Valley, my client is just another eyeball to which a metric will be assigned. They call it ARPU or Average Revenue per User. When looked at closely, of the $3.32 on average that Facebook earns out of every user who signs up, my client can directly contribute only $0.11 to the company. So, if Facebook were to even as much as attempt to live exclusively off what my client is willing to pay it, the company’s business model will crash overnight. So, I can safely infer it has a perverse incentive to monetise information that pertains to my client—including, but not limited to introducing advertised material into what he sees and influence what discourses he engages in. That is also why, there is a value entities like these place on my client. Publicly available records have it that on average, if my client can be influenced in just the right ways, Facebook can earn $158, Google can squeeze $182 and Amazon $733. These numbers are the set of lenses through which my client and billions of people in the world are looked at by a few dozen people in Silicon Valley. If my client is just that, what about the future of my client’s children? They are enamoured by all the promises the internet holds. Are these promises real? If these innocent minds click on anything, these entities will profile their minds, and eventually persuade them to do their bidding. Add to this Moore’s Law which postulates that the processing power of computers will double every two years. The most recent evidence suggests it is alive and gaining momentum. 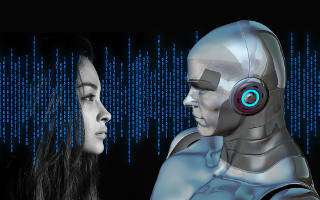 That is why my client can imagine a future where crucial decisions will not be taken by his descendants, but by artificial intelligence bereft of consciousness. And a future that the species Homo Sapiens, his descendants, are staring at is bleak. The historian Yuval Harari thinks it is inevitable that there will be a “useless class of humans”. The only narratives my client now knows and hears of are the ones dictated by these entities. So, if these platforms decide they can maximise their profits by manipulating the discourse on either side of the border and get a cricket match to trend, they will do just that. How else does a game of cricket manifest itself into the domain that is policy making and infuse it with such venom where decision makers must take calls on whether or not a game can be played on domestic soil or on some foreign land when there are other pressing matters to resolve like poverty and malnutrition? May I then submit that my client’s children are born into slavery of an altogether different kind? They are slaves to discourse on these platforms that may or may not be controlled by the stakeholders on them. But any move to curtail their reach may be perceived as hijacking freedom of speech. But who is to curb these platforms and the discourses on it? The government? My client does not trust the state. History is witness to systems like Socialism and Marxism in which the state claimed it would distribute resources equitably, but eventually became an actor that created dictators. It was inevitable that those systems collapse. That is what my client’s forefathers did not want. They wanted for him the right to free speech and freedom of expression in the country of his birth. That is why they fought the mighty British empire and the petty Indian principalities that owed their allegiances to them and crafted a forward-looking Constitution that guaranteed him these rights. But given the nature of the current discourse, the ground beneath his feet is disappearing. Isn’t it time my client stood up for himself and the future of his children? After hearing both the lawyers out, and when thought about dispassionately, it is clear nothing is absolute. The quest to find where truth lies is a complex one. Both Lawyer #1 and Lawyer #2 are right. But both are wrong as well. Though, if I, the judge, were to be compelled to take a call, in whose favour do I adjudicate? This is where we get into morally ambiguous territory. If I adjudicate in favour of Lawyer #1, then my stated position is that I am anti-rich and against freedom of choice. Now, what can possibly be criminal about being rich? In a free world, you get rich on the back of hard work. And in any free society, whether to pay for a service or not falls under the domain of the right to choose. Where, indeed, is the moral ambiguity in that? If I adjudicate in favour of Lawyer #2, another set of issues come up. Despite having the resources to pay, the rich may decline to pay, but insist on partaking from all the perks that a free society may confer. But with great freedom comes great responsibility. So, in a democratically elected system, everybody pays taxes in some form. Now, imagine this. In the world we live in, there is no taking away from that the internet is an empowering tool. But to access high quality content, you need access to high speed bandwidth. The system insists there is a cost to it and everybody who wishes to access this bandwidth must pay for it. For instance, there is much rich educational content on the internet. In principle, access to the content is free. But broadband pipes must be in place. The rich can choose to buy access to broadband pipes; go to an institution of their choice for an expensive education; or opt out of education for that matter because in any which case they have an economic advantage and don’t need to work. But for the poor, they know the content exists and it is their hope to the future. But the pipes that may deliver it to them are expensive, as is the education. Something must give way. Think of it as “opportunity cost”. If they don’t exercise this cost, they are condemned to poverty. To that extent, the burden on the poor is higher. History has it that if left to the elected system to distribute resources optimally, any system stands the risk of being subverted to favour those in power. In any case, entities designed and built to maximise profits are intended to do just that. In theory then, there is nothing morally ambiguous if an entity like this subverts the system to extract economic value out of everybody in any way it chooses. If not by way of money, it could be by way of time. If the rich won’t pay and the poor cannot afford it, why not extract their time then? 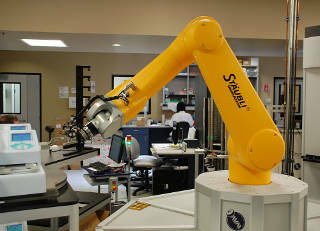 The most recent advances in science and technology allow entities to do that. 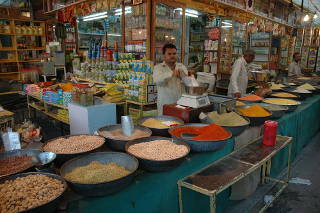 It can eventually be used to create and design things as well as the way people behave and buy. And it can be used to influence popular discourse. An all-encompassing term is used to describe it. Persuasive Technology. I am not implying here it is good or bad. Anything is as good or as bad as the people who deploy it intend it to be. By way of analogy, is nuclear energy good or bad? Yes, to the extent that it can be used to produce energy in far more efficient ways. Bad, in that it can wipe humanity out. It is much the same with Persuasive Technology. It is as good or as bad as the intent of the people, companies or governments that choose to deploy it. But here again, who gets to decide the intent and how will all of it play out? Quite honestly, I don’t know. But history has its own way of going about things. When I raised the case of the lawyers arguing it out in my head in a casual conversation with Shankar Maruwada, CEO of the NGO EkStep, he made an interesting observation. He was just back from a trip to the US, the so-called land of liberty and free speech. A little over 150 years ago, he thought aloud, while men like Abraham Lincoln declared in public they were opposed to the idea of slavery, in his personal life Lincoln was a morally conflicted human being. This is a well-documented fact and the subject of much research. But now, nobody, anyplace in the world, will suggest a black man is inferior to a white man. If he does, his morality will come under scrutiny. If that yardstick is to be applied, are there any lessons history can offer us while we settle down to watch the cricket match between Indian and Pakistan without bile flowing through our systems? My submission is that in baying for the rival’s blood in a sporting event on a Sunday evening, we’re going back to where our forefathers wanted to get away from. Being primates and hunter gatherers. There are bigger problems staring us in the face. Hunger right now and extinction in the imminent future. This is not to suggest you don’t enjoy the match. That is what sport is for. But can we do it minus the vitriol? This is not to suggest you don’t enjoy the match. That is what sport is for. But can we do it minus the vitriol? Can the boys on the field be spared? And on Monday morning, can we get down to work as usual? There won’t be any national glory or eternal shame if a match is won or lost against Pakistan. If anything, what the Lessons of History tells us is that time has a wicked sense of humour. Because like I articulated at the outset, for the life of me, I fail to understand why a match between India and England does not generate as much animosity or anger. Didn’t those blokes from England cross the oceans to plunder our country, lord over our ancestors, live like kings in palaces away, call us handsome men brown clowns, and while they were at it, scoot away with some of our beautiful lasses as well?